Ever dipped apples into Greek yogurt? It’s pretty ok. Not my personal first choice honestly. This dip is a whole different thing though. The base is Greek yogurt, but you might never know because it tastes like the rich insides of a chocolate truffle with the creamy texture to match. How could yogurt transform so? It’s actually one of the more simple things I have whipped up recently, but the taste and texture are so on point it feels much more special than just a handful of normal ingredients. This was something I developed for an educational tasting focused on antioxidants. The idea was to create a snack dip packing in as many antioxidants as possible in a way anyone could recreate at home, while still being super delicious of course. 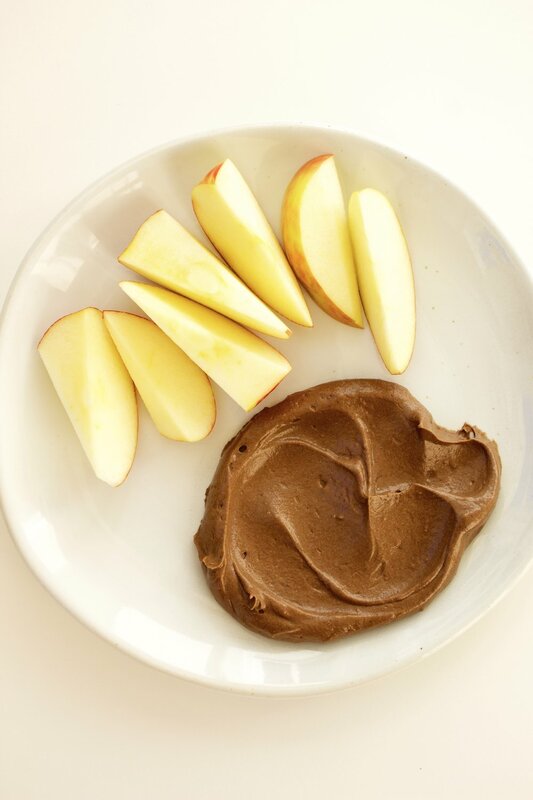 Antioxidants in this snack come from the apple (or other fruit you may dip in), cocoa powder, almond butter and a little from the honey. When to eat this? (Besides just constantly) This dip makes an awesome snack that is balanced to fuel you through to the next meal and support muscle recovery from training by providing high quality protein. It is also quite a satisfying dessert that seems much more indulgent than it really is. This is one of those things future you will be sooo happy to find opening the fridge when it’s time for snack scrounging. So make some! And make extra! Store covered in the fridge for up to 5 days. Notes: Need more carbs/calories/energy? Use vanilla flavored Greek yogurt. You could definitely use peanut butter in place of the almond butter. I would use smooth though for sure. Either dutched (dark) or ‘natural’ (lighter) cocoa powder are good in this. The dutched one will just give it a deeper color and chocolatey flavor.